We are looking for staff for the next high season. The working period is from November 2018 to March 2019. Are you outgoing, customer service and sales oriented, flexible and hard-working? Are you interested in nature, underwater world and a new cultures? Can you cope under pressure and take charge in unexpected situations? Are you motivated to work hard even if the days sometimes run late? Do you feel like water is your second home, which means you’re a strong swimmer and are in good physical shape? Have you worked with sales, and do you get people excited about things and are an excellent fit to speak in welcome meetings in hotels. Are you good a leading groups? 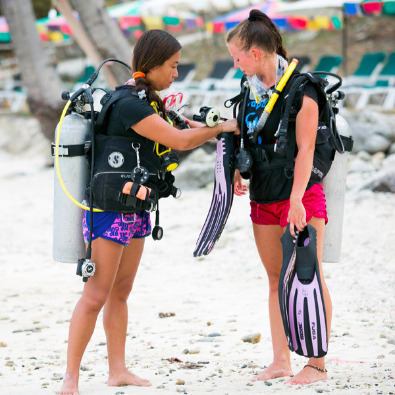 Have you already completed your PADI OWSI course and worked as a Dive instructor? Do you have experience from diving in tropics and underwater world feels like the office you want? Are you a seasoned sales person with experience, skills and passion to make your customers happy with your products? Have you ever dreamed about an office under the palm trees and a dress code that includes a strict no-tie policy? Are you at least 20 years of age, outgoing, customer service oriented and easily adaptable person,who has motivation to work hard on long working days and studying hospitality or business? Are you interested in foreign cultures,nature and world under the surface? Are you dreaming of a career in diving? Have you just started your hobby or maybe you are more already an experienced diver? Would you be interested in working as an assistant for diving instructors and work in exchange for free diving courses? Are you precise and meticulous, responsible and willing to take iniative – even a great sales person? Do you administer computers and programs?